To his noble highness and courageous Maximilian Norbert Krakovský, Count of Kolovrat na Týnici and Petrovičích, Leopold Antonín Count Trautmansstorff, freeman of Gleichenbergk, Negav, Burgav, Taczenbach and Vobříství, and Jan Váczslav František Obitecký of Obitecz na Janovicích, Petrovice and Zhoři. Our respective secretary and other counsellors, chamberlains, high chamberlain, and under-chamberlain of our hereditary Kingdom of Bohemia. Josef by the Grace of God Elected Holy Roman Emperor, for Ever and Ever the Multiplier of the Empire, King of Hungary and Bohemia. Highly Noble and Brave, Dear and Loyal Subjects! We herewith make it known that Kristian Josef Willenberg, engineer, sub praesentato the thirtieth day of the month of January of this last Seventeen Hundred and Fifth Year, did obediently apply to the great Emperor Leopold of that name the first, our late beloved father, according to this written attached script in the Czech language, that a certain yearly pay be awarded him by the loyal and obedient estates of the hereditary Czech Kingdom for the teaching the craft of engineering to the youth of the noble and municipal estates, to be set up and paid for his sustenance; and his plea having been remitted to the Royal Chancellery of our Czech Court on our Court Council of War to examine by the attached written decree his suitability thereto, in this now past Seventeen Hundred and Sixth Year, and having been, by a military commission experienced in engineering and established for that purpose, properly examined, and having sufficiently demonstrated his art of engineering, and having special experience from our above-mentioned court military council, as acknowledged not only in the text of this decree submitted in original, in which the applicant is recognized as an Imperial engineer, and also by our gracious decree on the fifteenth day of the month of December of this now past Seventeen Hundred and Sixth Year, by our grace so granted and bestowed. As is generally known to one and all, in our Czech Kingdom there is a great want of engineers who in the present time of war would be very needful and beneficial to us and to the general good; thus the above-mentioned Willenberg is to instruct twelve persons, of which six from the nobility, four from the knightly estate, and two from the municipal estate, in fundamental engineering, free without any charge, in exchange for a certain yearly pay by the province to instruct and teach, which was promised in that same submitted document of his; and we are very well satisfied with his declaration. 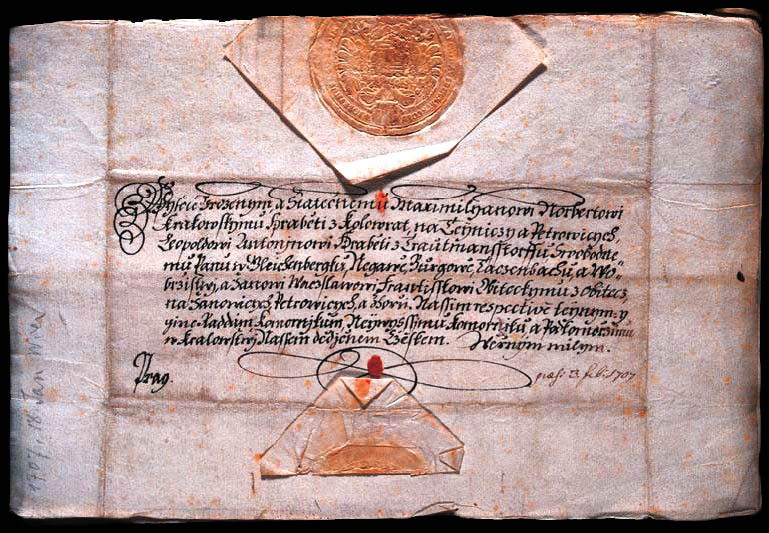 Therefore we order, for the good repute and benefi t of the kingdom and our hereditary lands, that you introduce the matter of the above-mentioned Willenberg as a faithful and loyal person to the assembled Estates at the gathering of the municipal assembly, and that you spare no exertion to negotiate with Willenberg in regard to his lifelong annual pay, having in mind the benefit to the entire kingdom, and that they agree with him, upon which you will, aside from returning the attached order to the hands of our Bohemian chancellery at the royal court, not neglecting to obediently carry out our gracious Royal and Imperial will, for which our Royal and Imperial grace be upon you. of our heraditary Kingdom of Bohemia.